• Who is the most recent major leaguer to compile 100 or more hits, 20 or more complete games, and 20 or more decisions in the same season? No, the answer is not who you think! • Who is the only pitcher to hurl a minimum of 5,000 career innings and surrender fewer hits per 9 innings than Walter Johnson? • What team had a record of 52–62 when the strike shut down the 1994 season but was on track to qualify for postseason play with the lowest winning percentage ever by a division or league first-place finisher? Every era of baseball history is represented from Cap Anson to Mike Trout, Cy Young to Clayton Kershaw, Ty Cobb to Jose Altuve, Babe Ruth to Giancarlo Stanton. 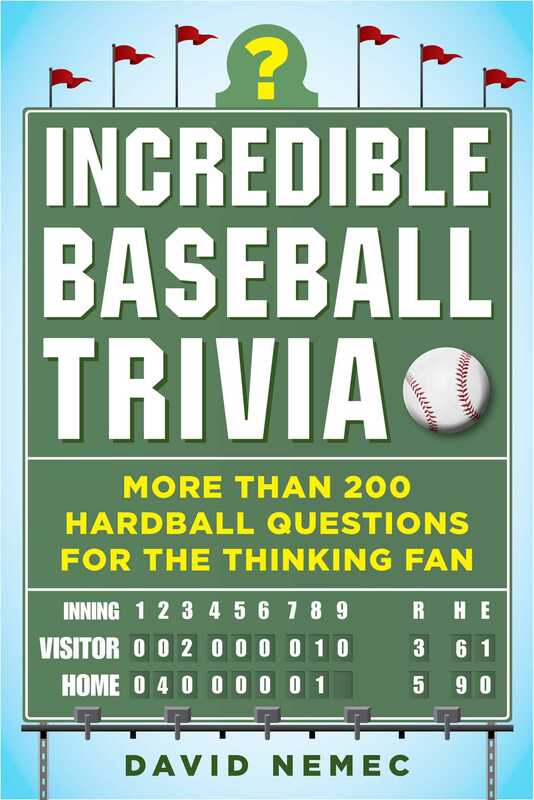 Incredible Baseball Trivia is the ultimate test for knowledgeable baseball fans! David Nemec is the author of The Great Encyclopedia of Nineteenth Century Major League Baseball, The Beer and Whisky League, 20th Century Baseball Chronicles, Early Dreams, Major League Baseball Profiles: 1871-1900 and many other works on baseball. Nemec has won numerous SABR national baseball trivia contests. He currently lives in Laguna Woods, California.